Deedrio couldn't access a particular Web site that had never before been a problem, and turned to the Web Browsing and Email forum for help. You've got two tasks here. First, you need to find a workaround that will let you to get to the site. And second, you need to fix the underlying problem so that you don't have to keep using a workaround. Actually, the underlying problem may not even be yours. The site could really be down. To find out, visit http://www.downforeveryoneorjustme.com, enter the URL, press ENTER, and wait for the results. If Downforeveryoneorjustme tells you that "It's not just you," there's not much you can do about it. Someone else has to fix it. If you have a way to contact the people running the site, inform them of the problem. Try another browser. If you're using Firefox or Chrome, try Internet Explorer--or vice versa. This won't be a real, permanent solution. But it might help in a pinch. Use the IP address. Every Web site has a unique IP address. To find the one for your problem site, visit Self SEO's IP finder. Copy and paste the address into your browser's address bar. If this works, the problem is definitely on your end. Try the suggestions below for a permanent fix. and press ENTER. Once the file is up, look for the problem site's domain name. If you find it, insert a pound sign (#) at the beginning of the line that contains it. Save the file, restart the browser, and try again. Check to see if you've blocked the site. You do this through the Internet Properties dialog box. To access it in Vista or Windows 7, click Start, type internet options, and press ENTER. In XP, select Start, then Run, type inetcpl.cpl, and press ENTER. 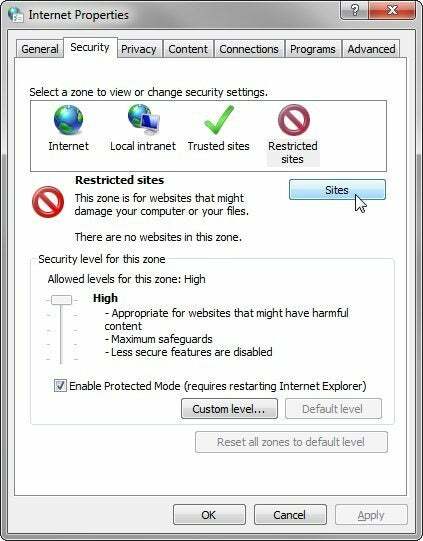 Once you're there, click the Security tab, then the Restricted sites icon, followed by the Sites button. If the site's on this list, remove it. Then click the Privacy tab, and, again, the Sites button. Remove the URL if it's there. Change your DNS server. See Speed Up Your Internet Connection by Changing Your Domain Name System Server for instructions.